Why Poland? The Tatra Mountains of course. This mountain range has everything from easy strolls along the shores of Morskie Oko to rock climbs of the highest degree. Not only are there are over 300 kilometres of colour coded footpaths with varying degrees of difficulty but there are a number of huts from rustic to more celunbrious where you can enjoy a soup and a beer or an overnight stay. Recently Poland became part of the European Union which has made travelling there so much easier. The walks I have put together are at the lower end of the difficulty scale and if the weather behaves itself you will have another great walking holiday! Spend some time wandering around the cobbled streets of the old city of Krakow and don't forget to visit the salt mine at Wieliczka, 13km south-east of Krakow. If you have the time visit take a day trip by train or bus to Auschwitz, 54km west of Korakow. A week to ten days is enough in Poland. 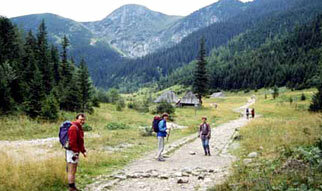 So combine your walk in the Tatra Mountain with a cycle from Prague to Vienna.